The most straightforward method of getting music on your Samsung Galaxy S 5 phone is from an online music store. You can download a wide variety of music from dozens of mainstream online music stores. The Play Store is an option. In addition to apps, it has music and video. Other well-known sites include Rhapsody, Amazon MP3, VEVO, and last.fm. In addition, many more specialty or “boutique” stores provide more differentiated offerings than you can get from the mass-market stores. For example, MAQAM offers Middle Eastern music. 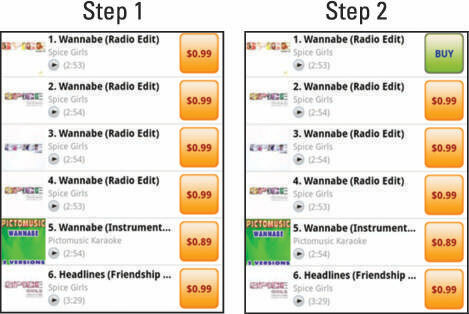 The details for acquiring music among the online stores vary from store to store. Ultimately, there are more similarities than differences. 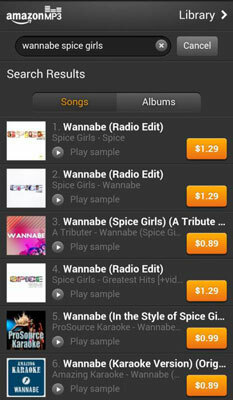 As an example of when you know what you want, what you really, really want, here’s how to find and download the song “Wannabe” by the Spice Girls. You could use Amazon MP3. If you don’t have Amazon MP3 in your Application list, you would start by loading that app on your phone. 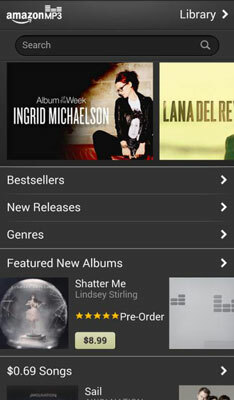 When you open it, you see the screen shown for Amazon’s MP3 home screen. Enter the relevant search information in the Amazon MP3 Search field. In this case, I’m searching for “Wannabe” by the Spice Girls. The result is the search for songs. The search results come up with all kinds of options, including albums, individual tracks, similar songs, other songs from the same artist. Be ready for these options. To purchase the track, tap twice on the price. The left screen shows the price. When you tap once on the price, you get a confirmation message to make sure that you want to buy the download; the price is replaced with a Buy icon. To buy, tap Buy. Unless you’re going to subsist on the free MP3 files you can get from this site, you need to pay. To pay for files at an online music store, you need an account and a credit card. 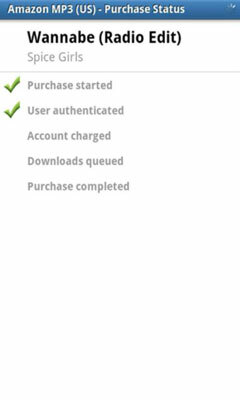 This process is similar, if not identical, to signing up for Play Store. You need your e-mail account, a password, and in some cases, an account name. 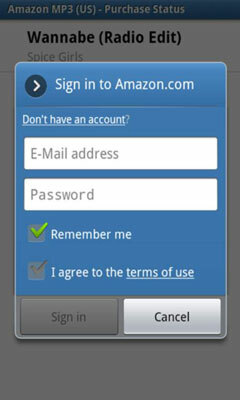 In the case of Amazon MP3, you already have an account if you have an account with Amazon. If not, you’ll be asked to create an account. After you enter this information, the file will automatically begin downloading to your phone, and a progress screen lets you know when you’re finished. The song is now loaded on your phone. When you open the music player, it’s ready for you to play.